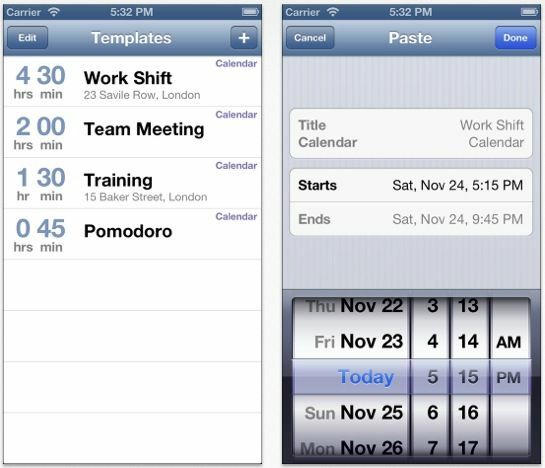 Calendar Paste is a calendar events templating app for iOS. It’s a place where you can store calendar events that don’t repeat in a predicable patten, or that only need to be in your calendar at certain times. It’s one of those apps you never thought you needed. Calendar Paste is perfectly suited to those events that keep cropping up, but not so regularly that you can set a repeating calendar item to keep track of them. They’re things that happen every now-and-again, things that crop up unexpectedly but repeatedly. Things you have to add to your calendar and it bugs you every time because arrrgh you wish there was a quicker way. Calendar Paste is it. You set up templates for events and save them in here. When you need to add them to your actual calendar, a couple of taps will do it. Your templates have a title, a location and a duration. There’s optional alerts, URLs and a notes field too. Set them up and forget about them until the time comes. When it does, you can add one of your templates as a new event to your primary calendar with a couple of taps. It will work seamlessly with the built-in Calendar app in iOS, which means your event will get synced through iCloud or with Google Calendar or any other extras you normally make use of. Adding a template as a scheduled event still means that you have to specify the date and time it needs to happen, so you’re not saving all the steps needed to add an event in Calendar. But you are saving some of them. I think Cal Paste will have limited appeal, mainly to people who find themselves constantly setting up new items in Calendar. Maybe it’s work meetings, maybe it’s rehearsals, maybe it’s meeting friends for a drink, maybe it’s many variations of all of those and more. If you inwardly groan every time you open up Calendar and start typing the same thing for the 200th time, Calendar Paste is definitely for you and worth spending a dollar on. It’s not the only app of its kind on the Store, but is certainly one of the better-looking ones amongst its rivals.